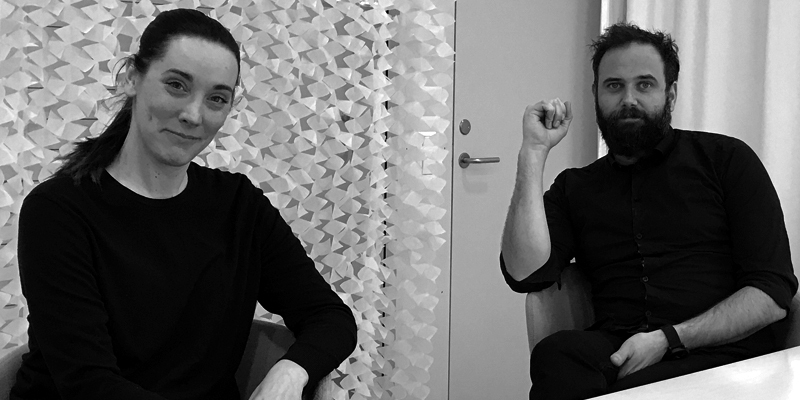 Åsa Bjerndell and Martin Sundberg, both working at White Architects and part of the team involved in The Loop project. The Loop lies between two unique research establishments, the European Spallation Source (ESS) and the Max IV Laboratory, in Science Village on the north-east edge of Lund. You can’t take it for granted that it will become a destination even though both entities are a huge draw. You’ve got to create a highly attractive place that people will want to stay at and want to return to. A lot of the research work done at ESS can, in fact, be done in Copenhagen so why spend time in Science Village? That’s why the design and concept are vital in creating a place where people can meet and add value. It is, quite simply, a prerequisite in achieving the local, regional and national goals that have been set. – It’s always difficult being the first on the block but The Loop has the potential to become that destination – a place you really want to go to. Hopefully as Science Village starts to grow there will be a natural momentum but The Loop has to be so attractive so that it becomes the destination itself. We talk a lot about the landscape, the climate and the challenges…and also the potential. 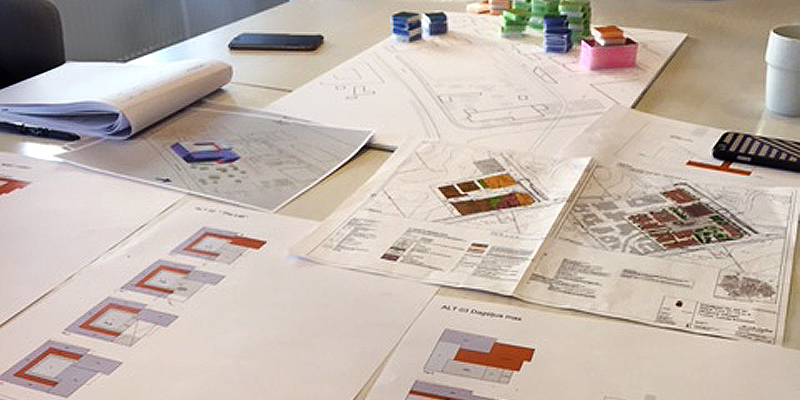 If you focus on these aspects, chances are that it will indeed become a place with a strong character of its own and its own integrity, says Åsa and Martin, both working at White Architects and part of the team involved in The Loop project. White has been involved since August 2016 but it’s only now that they’ve really started to put pencil to paper. – It’s great to be able to get involved at such an early stage. It doesn’t happen very often especially when it’s just a single structure. On large scale jobs, like a whole estate, we are usually invited in at the concept stage. Our work then takes on a broader scope, and we’re one of a number of players involved. It’s a matter of understanding what we are going to do, discussing the physical attributes of the project and putting some kind of timeline together, says Martin. – It’s really exciting that we are being involved in this way for a project involving a single building. When we get a job like this, the whole concept is often done and dusted and they just ask us to come up with a design. But in this case, we can contribute so much more as we get to understand the ‘why’ and not just the ‘how’ and the ‘what’. It means we can be even more creative in coming up with a solution. According to White, being involved from the start means that they, as architects, can really contribute to delivering the whole vision. The focus is on the opportunities rather than the challenges and limitations. White Architects is local to the Skåne region but is part of a larger group with 900 employees throughout Sweden. The company has resolutely built up its own active internal network. Its philosophy is that knowledge should not be considered in isolation – it needs to be accessible to everyone in the business. Knowledge-sharing is part of White’s culture. – Åsa and I have all the contacts we need. All we have to do is pick up the phone and ask. The great thing is that it’s not just something that sounds good or looks great on paper. It really works in practice. The network also gives us access to our own funds for R&D. We are really into the whole R&D thing, in fact we are really driven by it. I think that’s why we get on so well with Skanska. They like to work in the same way. They are also a big business with a well-established and highly qualified internal network. They can access the necessary expertise from anywhere in the world. – As an architect, it’s nice to be able to call on experts at any time. And everyone really wants to help, especially when it’s a unique project like The Loop. Everyone wants to be involved, says Åsa with a laugh. Although White has been tasked with the actual design of The Loop, Skanska has opened the process to anyone who thinks that they may be able to contribute. As Åsa points out, it’s a bit unusual but that’s what makes it so exciting. The project may take an unexpected turn, and nothing is written in stone from the start. Although openness is part of the product, no one is forgetting the reality of getting people to rent the offices and work here. – An office block is more than just an office block. That’s another reason it’s such a stimulating project and means that we have skin in the game right to the very end. The aim is to make The Loop generate more energy than it uses, both architecturally and environmentally. That’s a big challenge for White. It’s also part of the project’s ‘wow-factor’. In its business plan, White states that it is going to do 30 climate-neutral projects within three years. That’s thirty more than anyone else has ever done. The fact that customers have started to express a desire to go down this path made them realize that they were on the right track. – Ten years ago, it was a pretty big deal for a building to be LEED – certified (Leadership in Energy and Environmental Design). Now it’s more or a less a given. One of the hygiene factors. We’re now moving on and creating our own standard, taking things to the next level. It’s exciting and really interesting and Skanska’s already there in its way of thinking, enthuses Martin. – I’d love to have an office in The Loop…to just be in that environment, to be in the meetings, to feel that you were influencing things. It would be fantastically exciting and would suit us down to the ground.